Reference ranges of lipoprotein (a) (Lp[a]) vary and depend on assay and reporting laboratories. They also differ by population and may differ regionally worldwide. Nonetheless, many US lipidologists generally consider an Lp(a) level of less than 10 mg/dL to indicate a lower cardiovascular risk. levels higher than 10 mg/dL are associated with an increase in cardiovascular risk (see Interpretation). The apolipoproteins have a primary responsibility for the transport of lipids and cholesterol. 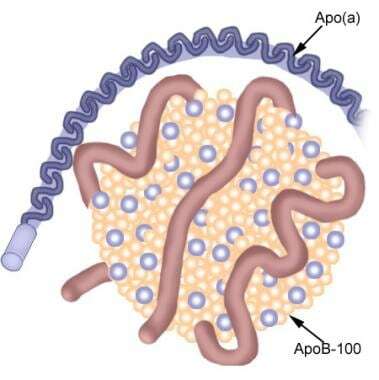 Apolipoprotein B (apoB) is a nonexchangeable lipoprotein that exists in two forms in humans, apoB-100 and apoB-48. Lipoprotein(a) is collected as part of various panels constituting what is known as "advanced lipid testing." These panels are offered by various commercial entities and include those which offer LDL particle testing. Lipoprotein (a) (Lp[a]) is composed of a low density lipoprotein (LDL) particle with an apolipoprotein B-100 (apo B100) component that is covalently linked via a disulfide bridge to an apolipoprotein (a) molecule, which is highly homologous to plasminogen. [3, 5] See image below. In the Copenhagen Heart study, Kamstrup et al found that genetic elevations of Lp(a) were associated with an increased risk of myocardial infarction. Furthermore, several prospective epidemiological studies have indicated a causal role for Lp(a) in cardiovascular disease; thus, measurement of Lp(a) may be used as a determinant of cardiovascular risk within the context of a global cardiovascular risk assessment. Lp(a) is not recommended to be used alone as a sole test for determining cardiovascular risk, but rather as an additional measure to be combined with assessment of traditional cardiovascular risk factors. The measurement of Lp(a) may be most useful in intermediate-risk patients or in those in whom the test result would affect treatment or the aggressiveness of treatment of known cardiovascular risk factors. Ghorbani A, Rafieian-Kopaei M, Nasri H. Lipoprotein (a): More than a bystander in the etiology of hypertension? A study on essential hypertensive patients not yet on treatment. J Nephropathol. 2013 Jan. 2(1):67-70. [Medline]. [Full Text]. Michael H. Davidson. Management of Dyslipidemia by Patient Profiles. The Mobile Lipid Clinic: A Companion Guide. 2nd ed. Philadelphia, PA: Lippincott Williams & Wilkins; 2005. 197-98. Ridker PM and Libby P. Risk Markers for Atherothrombotic Disease. Bonow RO, Mann DL, Zipes DP, Libby P, eds. Braunwald's Heart Disease: A Textbook of Cardiovascular Medicine. 9th ed. Philadelphia, PA: Elsevier Saunders; 2012. 927-28. Kamstrup PR, Benn M, Tybjaerg-Hansen A, Nordestgaard BG. Extreme lipoprotein(a) levels and risk of myocardial infarction in the general population: the Copenhagen City Heart Study. Circulation. 2008 Jan 15. 117(2):176-84. [Medline]. Genest J and Libby P. Lipoprotein Disorders and Cardiovascular Disease. Bonow RO, Mann DL, Zipes DP, Libby P, eds. Braunwald's Heart Disease: A Textbook of Cardiovascular Medicine. 9th ed. Philadelphia, PA: Elsevier Saunders; 2012. 983. Kamstrup PR, Tybjaerg-Hansen A, Steffensen R, Nordestgaard BG. Genetically elevated lipoprotein(a) and increased risk of myocardial infarction. JAMA. 2009 Jun 10. 301(22):2331-9. [Medline]. Marcovina SM, Koschinsky ML, Albers JJ, Skarlatos S. Report of the National Heart, Lung, and Blood Institute Workshop on Lipoprotein(a) and Cardiovascular Disease: recent advances and future directions. Clin Chem. 2003 Nov. 49(11):1785-96. [Medline]. Gotto A, Pownall H. Manual of Lipid Disorders: Reducing the Risk for Coronary Heart Disease. 3rd ed. Philadelphia, PA: Lippincott Williams & Wilkins; 2003. Stone NJ, Blum CB. Management of Lipids in Clinical Practice. 5th Ed. Caddo, OK: Professional Communications, Inc.; 2005. Kolski B1, Tsimikas S. Emerging therapeutic agents to lower lipoprotein (a) levels. Curr Opin Lipidol. Dec 2012. 23:560-8. Paul E. Richardson, Medha Manchekar, [...], and Jere P. Segrest. Assembly of Lipoprotein Particles Containing Apolipoprotein-B: Structural Model for the Nascent Lipoprotein Particle. Biophysical Journal. 2005. 88:2789-2800. [Full Text].